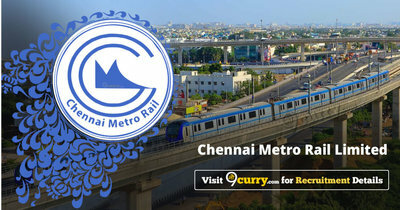 CMRL Recruitment 2019: Chennai Metro Rail Limited / chennaimetrorail.org is conducting recruitment processes to fill 6 vacancies. As of now, there is one recruitment drive going on for Walk in for Architectural Expert, Manager & Assistant Chief Controller Posts. CMRL Recruitment 2018 - Walk in for Architectural Expert, Manager & Assistant Chief Controller Posts in CMRL, Chennai, Tamil Nadu on Contract Basis. Candidates are invited by Chennai Metro Rail Limited to attend walk-in-interview to be held on 08 Dec 2018 for 6 vacancies. CMRL Recruitment 2018 - Job notification for General Manager Post (Track & Elevated) in CMRL, Chennai, Tamil Nadu on Deputation Basis. Applications are invited by Chennai Metro Rail Limited on or before 09 Nov 2018 for 1 vacancy. CMRL Recruitment 2018 - Walk in for Assistant (Accounts) Posts in CMRL, Chennai, Tamil Nadu on Contract Basis. Candidates are invited by Chennai Metro Rail Limited to attend walk-in-interview to be held on 29 Sep 2018 09:00 AM for 2 vacancies. CMRL Recruitment 2018 - Walk in for Co-ordination Expert, MT & Other Posts in CMRL, Tamil Nadu on Contract Basis. Candidates are invited by Chennai Metro Rail Limited to attend walk-in-interview to be held on 06 Oct 2018 09:00 AM to 01;00 PM for 3 vacancies. CMRL Recruitment 2018 - Job notification for Director (Systems & Operations) Post in CMRL, Chennai, Tamil Nadu on Contract Basis. Applications are invited by Chennai Metro Rail Limited on or before 19 Jul 2018 for 1 vacancy. CMRL Recruitment 2018 - Job notification for 33 General Manager, MEP Expert & Other Posts in CMRL, Tamil Nadu on Contract Basis. Applications are invited by Chennai Metro Rail Limited on or before 28 Jun 2018 for 33 vacancies. CMRL Recruitment 2018 - Apply Online for PG Diploma Course in “Metro Rail Technology and Management” in CMRL, Madras, Tamil Nadu. Online Applications are invited by Chennai Metro Rail Limited from 27 May 2018 to 16 Jun 2018 11:59 PM for 25 vacancies.